For a long time I have been thinking about free trade versus fair trade. Trying to get developing countries out of the poverty trap and believing in markets I analyzed the reasons for the collapse of the Doha development round. Key reasons? 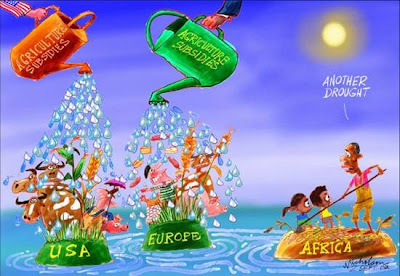 The US and Europe are creating a massive market distortion by their agriculture subsidies. What a double standard to call for free trade but excluding one of the very few areas where developing countries have a competitive advantage. This means: In the case of agricultural products free trade would be fair trade and helping developing countries! Read the full essay.